I'd greatly, greatly appreciate contact information. related to Thomas Ling, listed near him in that census. summer of 1853 or 1854, but died unexpectedly upon returning to Goulbourn. Soon after 1860 Ann Lyng married a Maurice / Morris Doyle. I don't know the date. my only original contribution to my family's genealogy for years of effort! names and that all this could be simple coincidence. of Patrick & Elizabeth Lyng as well as a little narrative of family tidbits he was given. Let me know if you'd like a copy. States -- New York State, Montana and California. and I had a good look through it yesterday. There are many familiar names included in it. I have gone through the early records of St.
Philip's RC Church in Richmond. The Lyngs and all of their neighbours show up beginning c.
records of those buried there, they would probably have been reported to the Priest at St.
Philip's. It's possible there are Lyngs there, as well as the other related surnames. There is a map of part of Marlborough Township, dated 1879, on our page at www.bytown.net/marlborough.htm . after John Dwyer -- see www.bytown.net/dwyer.htm . I'll add this e-mail to our Lyng page and hopefully, others will have more information for us. All the best, and thanks again for the family history. 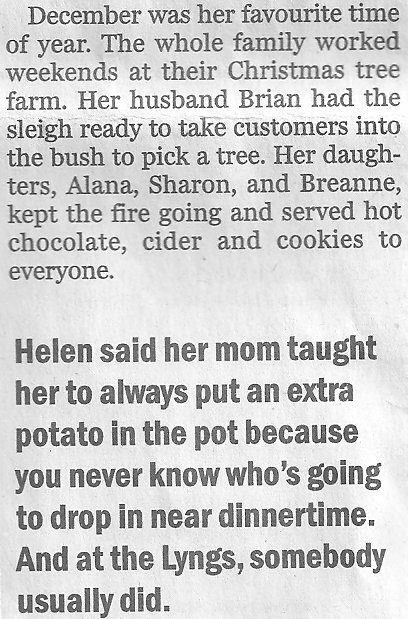 the Kelley family? Did you know about this Patrick Lyng? things using it including the obit I sent you. I think the Patrick is the son of Patrick and Elizabeth from your website. 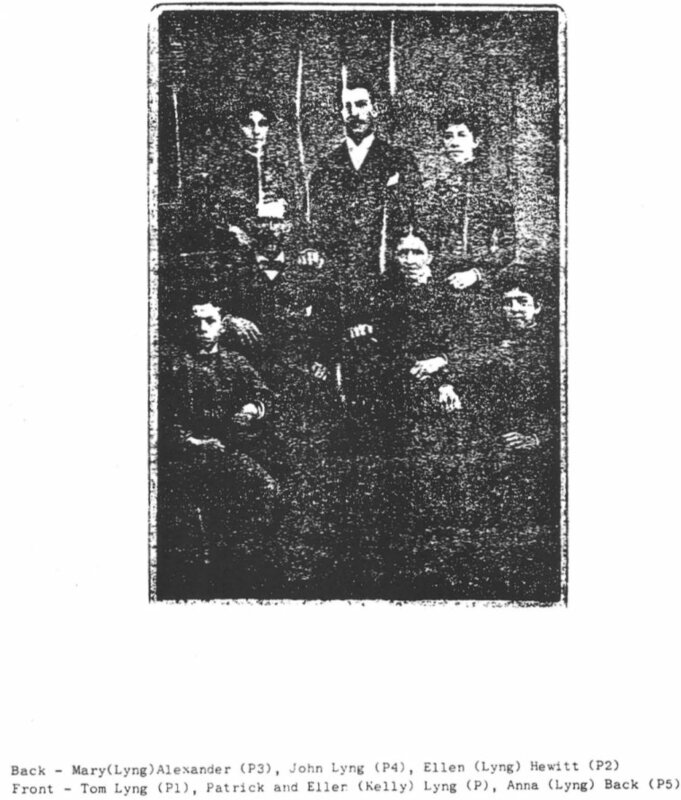 Maria, Elizabeth (I think later married Patrick Lyng), James, John, Patrick and Edward, another sister's name is unknown. Thanks for writing back. I have worked hard for a few years to locate information about family. 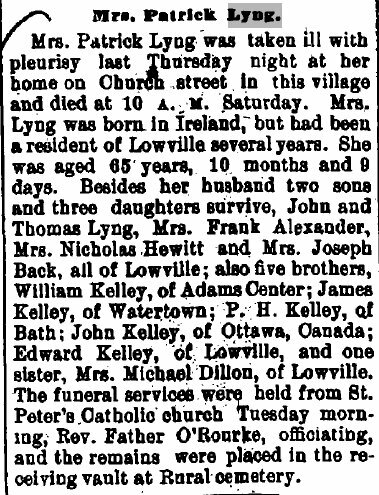 I did contact St Patrick's church in Lowville but still have not heard back yet. The photo below includes most of the persons named in your obituary. was written by Richard Allen in 1981. 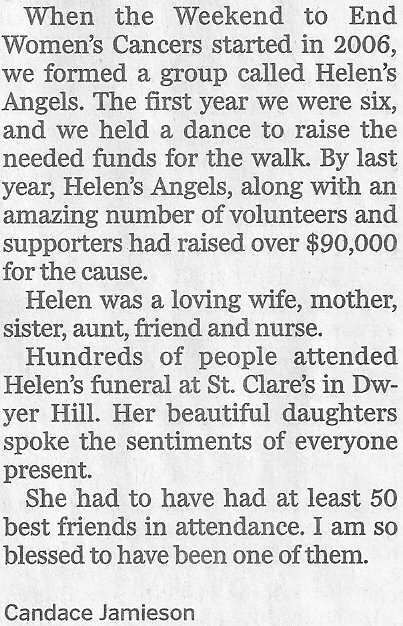 The Ottawa Citizen of January 8, 2012 contains a wonderful tribute to Helen McKenna-Lyng (page B5). 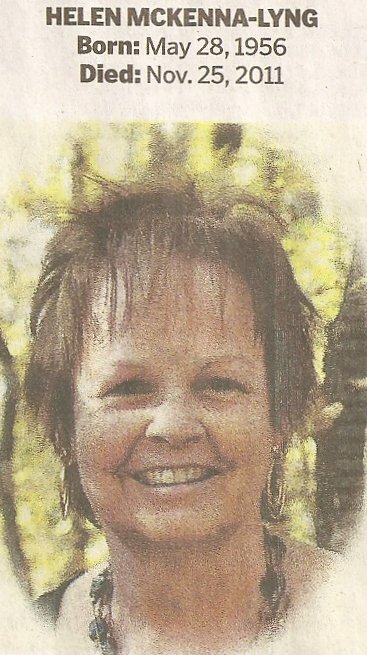 The article is written by her friend Candace Jamieson. Only a portion of the article is reproduced here. Keywords: St. Clare's Church, Dwyer Hill.